I was watching Everyday Food and the theme of the episode was one-pot recipes. As soon as I saw their recipe for chicken and dumplings, I knew I wanted to make it. I figured, why not right now? So I dropped what I was doing, went to the grocery to buy the ingredients, and made it for dinner that night. It was SO good! I LOVED it! A week or two later, I decided I wanted to make it again. The only problem was that I didn't write it down and I couldn't remember exactly what the recipe was. I thought, no problem, I'm sure I can find it on their web site. So, I googled it, and yes, I did find a recipe for Chicken and Dumplings, but it wasn't the same recipe! What's up with that?? Wouldn't you think the website and the TV show would be the same? Apparently, it isn't. Anyway, I decided to make it anyway, figuring I could just guess my way through it. Once again, it turned out great, although I'm positive that I did a few things differently. I probably would've tweaked their recipe anyway to make it the way I like it. So here's the recipe, just as I made it. 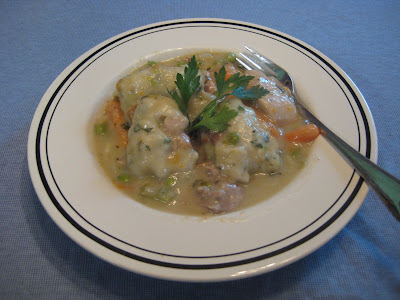 It's easy and simple and delicious and comforting and the dumplings are light and fluffy. Some people might wait until winter to make this one, but it's just too good to wait that long! It's great any time of the year! 1 large onion, coarsely chopped. Melt butter in a large heavy pot or Dutch oven over medium heat. Add onions, celery, carrots, salt, pepper, and thyme. Saute for 5 to 10 minutes, until everything begins to soften. Give it a good stir. Add flour and continue to cook for a few more minutes, stirring often to make sure nothing sticks to the bottom of the pot. Add chicken broth and stir to break up any clumps of flour. Trim chicken of any excess fat. Cut each thigh into 3 or 4 pieces, depending on how big they are. Nestle each piece of chicken down into the stew until just submerged. Place cover on pot, and let it cook for 15 minutes. Stir in frozen peas. Now it's time to make the dumplings. Combine flour, baking powder, salt and chopped herbs in mixing bowl. Make a well in the center. Combine egg and milk, mixing well. Pour into well in flour mixture and stir with a fork until just blended. Don't over mix! Drop by tablespoonfuls onto the surface of the boiling stew. Cook 10 minutes uncovered. Cover pot and cook another 10 minutes. You can use dried herbs instead of the fresh ones. Just use half as much. I like a LOT of vegetables in stews, so I added a a whole bag of carrots and a whole box of frozen peas. Add as much (or as little) as you like! I love using boneless thighs for this recipe because they stay tender and juicy. You can certainly use boneless breasts, though, if that's what you have on hand.